Portuguese Rice Cupcakes, known as Bolo de Arroz in Portuguese, are absolutely my favorite Portuguese sweet. Whenever I go to a Portuguese bakery this is the first thing I get to enjoy with some tea or coffee, and it is truly an amazing and unique sweet. These are one of the most traditional little treats in Portuguese baking and are the favorites of many. This wonderful recipe comes to us from Anna at Camera and Clementine, they have tons of great recipes so please check them out as well! Try it out and tell us what you think! 1) Pre-heat oven to 350 F degrees. 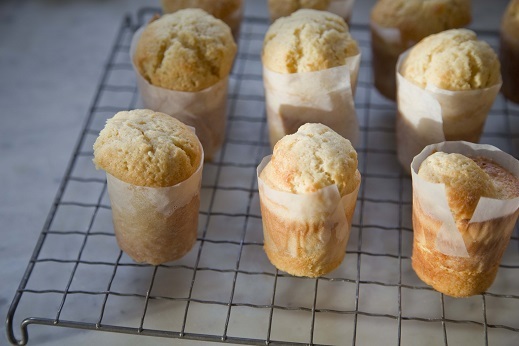 Prepare a muffin pan with cylindrical baking paper wrappers (like in the picture). 2) In a large bowl of a stand-mixer (or hand-mixer) whisk the butter with the sugar about 3 minutes, until creamy. 3) In a small pitcher, mix the eggs and egg yolk with the milk, lemon rinds and lemon juice and add to the previous mixture. 4) In another bowl, whisk the rice flour, baking powder, baking soda and salt and slowly add to the batter, beating until well blended. 5) Pour the batter half way into each of the cylindrical baking papers and let them rest for about 20 minutes. 6) Sprinkle granulated cane sugar on top and bake for 20 minutes. 7) Serve while hot and enjoy! where did you get the papers for the bolo de arroz? You can use any kind of baking papers, if you can’t find any of those you may use regular thin paper just the same. Just make sure to cut it cylindrical to fit the shape. Do you put something on the baking paperto hold the shape of the cylinder?? Aloha, from Hawai’i we jave a proud Açorean and Madeirian Tradition here. But we also have have Japanese, Chinese and Filipino baking traditions and they use two kinds of Rice Flour. So curious if just plain rice flour or do you use the sweet glutinous rice flour? Please clarify Obrigado!